Like a relay runner receiving the baton yards ahead of her nearest rival, Dilma Rousseff assumes the Brazilian presidency at the head of the strongest government in years, owing much to the person who came before her. Lula da Silva, enjoying stellar popularity at the end of his second presidential term, leaves a country flush with growth, fiscally stable and newly prominent on the world stage. However, although Lula’s popularity tilted the ballot in her favour, the perception that Ms Rousseff, a political outsider, has come to power on the coat-tails of her sponsor leaves her vulnerable to attack, both from within and outside the ruling Workers’ Party. Her biggest challenge will be to impose her own style on a leadership forged in Lula’s reflected glory. Lula’s charisma was a substantial factor neutralizing opposition during the last administration. Even under the worst corruption scandals he managed to dissociate his image from the PT. 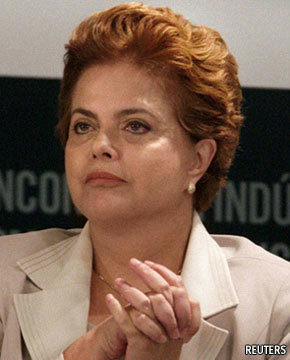 Dilma is not like him. Hopefully political forces will be more balanced and we will have more control over the executive actions. We should pay special attention to government expenditures.